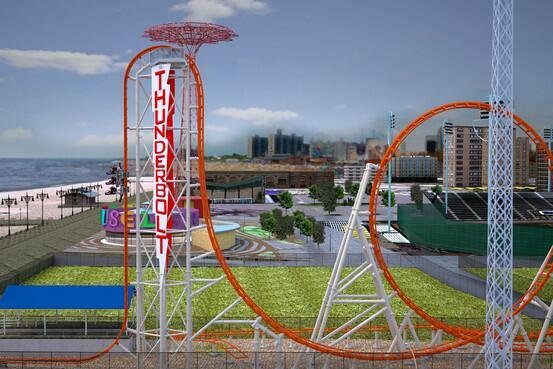 I am sorry people- I know they are attempting to revitalize Coney Island and make it the play mecca it once was – but this is NOT even close – where are the wooden beams that shook and threatened to come apart at the seams – and the jarring ride that shook my brain so hard I thought my brainpan would crack? This sleek contraption is no match for the original. 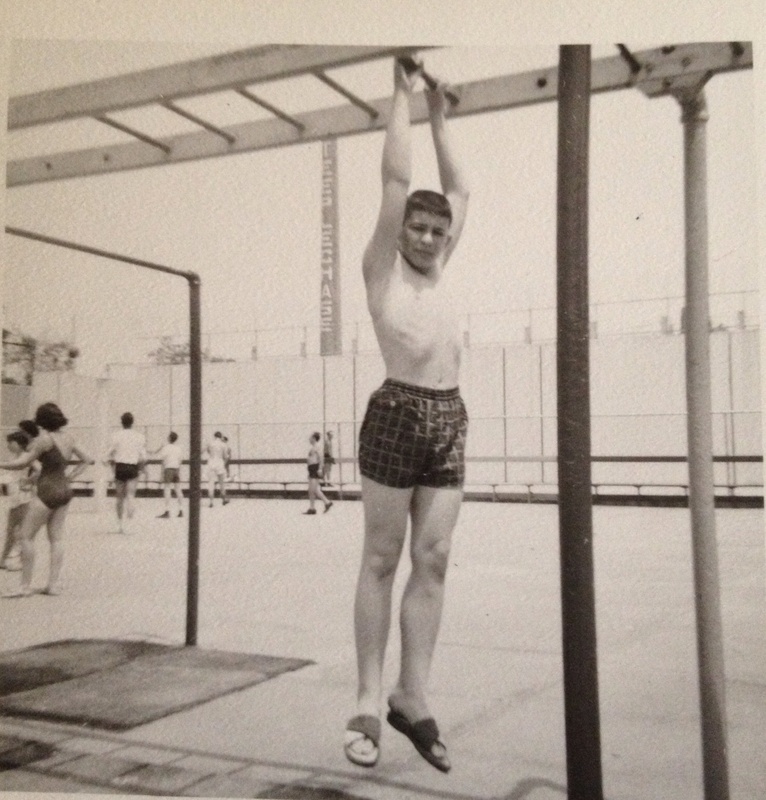 The Coney Island of my youth not only had the most marvelous rollercoasters it also housed some of the most unusual rides, eating establishments and bathing houses. And this is not the boast of “when I was your age” superiority – take a look at some samples and you tell me if there is anything commensurate today. 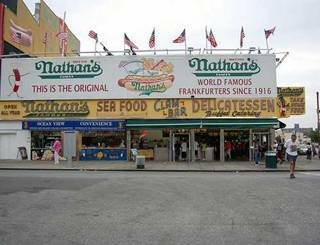 NATHAN’S – Opened in 1916 and still operating – Coney Island and Nathan’s are practically synonymous. Polish immigrant Nathan Handwerker started Nathan’s as a tiny hot dog stand using his wife Ida’s recipe. It was an instant hit, drawing customers that included Al Capone and Cary Grant. It is even said that President FDR thought them royally worthy and served them to the King and Queen of England. Crispy on the outside and spicy on the inside- Nathan’s frankfurters were the perfect Sunday afternoon meal along with crinkle french fries loaded with ketchup (more on this condiment addiction later) and my favorite ice-cold grape drink. Of course, an alternative to the fries could well have been a Gabila’s Knish (noted in an earlier blog) or its rival Stahl’s (never my choice, although relatives did like them). Both had open air stores on the Boardwalk. There were also great choices for desert and a little aftermeal entertainment, leading to the next unparalleled establishment. 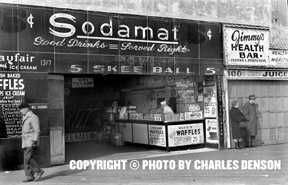 The Coney Island Sodamat Arcade was one of the first automated stores where for a nickel, you could choose from some 20 soda dispensers lined up side by side , each with a different flavor. On the opposite side vendors offered great slabs of perfectly cooked waffles smothered with globes of creamy ice cream- the hot and cold together certain to produce instant ice headache. 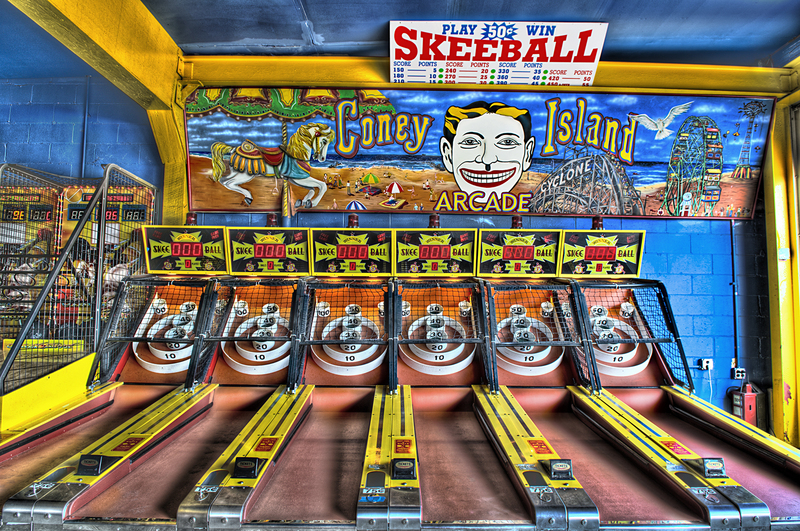 Moving a little further into the interior- you could try your luck at Skeeball– a game that still exists today. Coins inserted into a slot released 9 wooden balls – the goal was to bank the balls up an inclined ramp in such a way that it would fall into the innermost hole within a series of concentric rings – thus scoring the highest points. At the end of the round(s) total points were tallied and tickets were received to reflect earned points, which could then be redeemed for prizes that lined the arcade- the more valuable, the more tickets needed. Obviously, as with any prize given out in such an atmosphere- the monies spent playing the game clearly were more than the actual value of the prize- but no one ever minded. 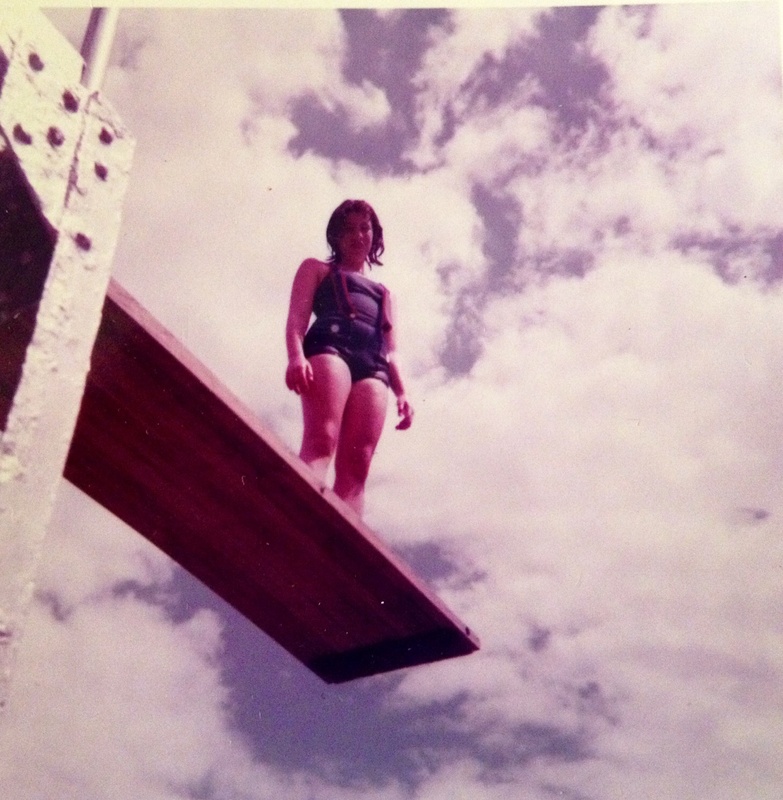 STEEPLECHASE PARK –See that eery smiling face in the above picture? That was the iconic logo for one of the most singularly incomparable amusement parks. 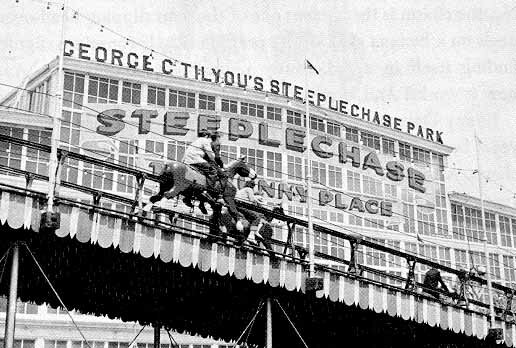 In 1897, land owner George C. Tilyou opened Steeplechase Park, a family oriented amusement park embracing the thrills of a horse race as its theme. 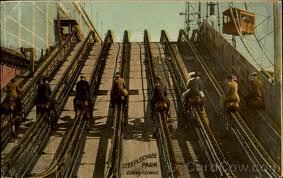 The Steeplechase Horses, as Tilyou called the ride, consisted of 6 double-saddled mechanical horses that took passengers down 1,100 feet of undulating track, over a stream bed and a series of hurdles, all around the outside of the park. 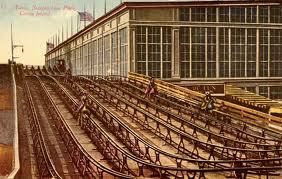 The tracks ran abreast, simulating a horse race in which gravity gave the heavier riders the advantage. Although you were strapped onto the horse – it was nonetheless terrifying, as the tracks went outside and around the buildings. And even when the ride was over- you still weren’t “safe.” At the exit of the Steeplechase ride you had to run the gamut- either over an opening that blasted air up your skirts while the crowd–generally recent victims themselves-looked on with approval (most women and girls, myself included wore skirts and dresses in those days) . Another path led to a clown who either prodded you with an electric shock or pummeled you with a cushioned club. Yeah – we thought this was fun! Steeplechase Park had other crazy activities. 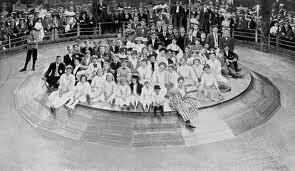 The Human Roulette Wheel spun until passengers sitting on it were flung to the perimeter, in a king of the hill type quest to get to the top. There were also giant wooden slides, revolving tunnels, swing carousels – so many choices that it was impossible to go on all. And, all the rides were included – at least in the earlier days – for a single payment. 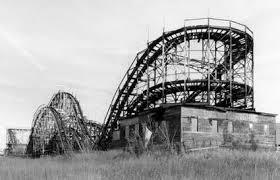 Later on, a holepunch disk was given out – and you could ride until all your holes were punched – and the big rides like the Steeplechase used up multiple punches. 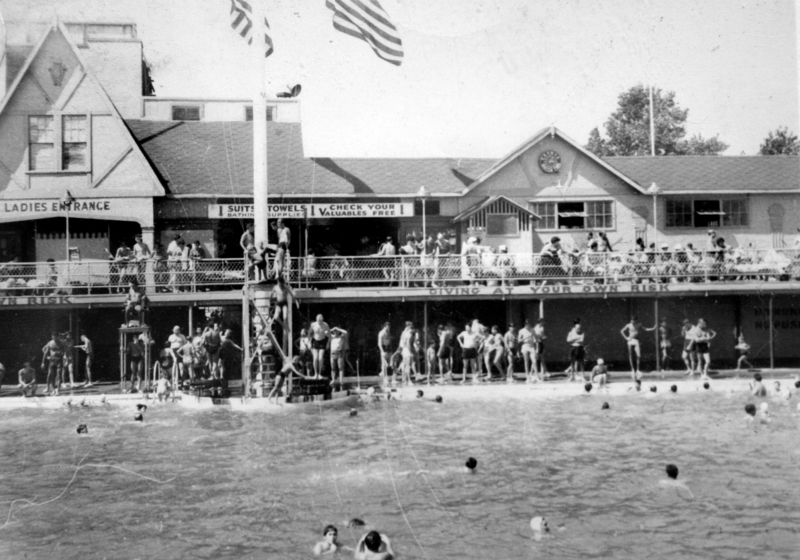 WASHINGTON BATHS – While “pool clubs” are not unique- this early version is still provided some of my happiest childhood memories so I believe it is worth mentioning- and it is the site where this blog’s title happened. My father didn’t make a great deal of money as a photofinisher at Berkey Photos (competitor that lost out to Kodak) and my mom was a homemaker as was the custom in those days – so we lived very simply, yet there were certain “inalienable” activities that my parents managed – ice skating at Prospect Park, bowling at the local lanes, countless visits to the Museum of Natural History, Planetarium, Bronx Zoo (I can probably be a docent at those last two) and family season passes to Washington Baths which was a few blocks west of Steeplechase Park. From July through early September we stayed at the baths daily (my father joined my mother, brother and me on weekends) from early morning to dusk – the men and women had separate locker facilities and as season pass holders – our area was a personally locked room, not as big as a cabana, but big enough to hold most of our summertime clothing and bathing needs. In addition there were sun decks where people could lie out sans clothes, hot and cold showers, makeup parlor with mirrors and shelves for bobby pins, combs (no portable hair dryers existed as yet) as well as steam rooms. I could never figure out if my inability to breath in those steam rooms was due to the intense steam or the visage of so much naked Shar-Pei like folds of flesh. And of course, from time to time people took a wrong turn on their way to/from the sundecks so we got quite an eyeful of both sexes in the jiggly buff – sadly people did not work out as they do today. This entry was tagged coney island, cyclone, french fries, horses, hotdogs, ketchup, nathans, NYC, parachute jump, pool, skeeball, steamroom, Steeplechase Park, thunderbolt, tornado, TRAVEL, washington baths. Bookmark the permalink. I loved reading this blog. It certainly brought back many fond memories of my youth. I did not like the roller coaster. I got really sick after the ride was over when I tried walking. Not a pleasant experience. I also want to share another unpleasant moment when I got off the parachute jump. Hate to admit it but I had a bladder accident which I tried hiding,but got caught. I went to Steeplechase with a friend of mine. My parents did not own a car so I was grateful that my friend’s parents offered to take me. Of course it also worked out for them since she was an only child, I was there to entertain her. The ride was long and a got dizzy. Couldn’t control my bladder. Since I was wearing dark pants I thought no one would see my accident, but of course that did not happen. 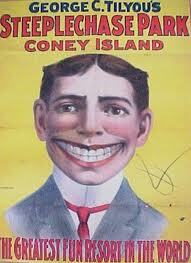 As you can imagine, I did not go to Coney Island for a very long time afterwards. After some time had passed I went back. I loved the rides, food and excitement of just being there. Thanks for reminding me of a very happy time in my life. 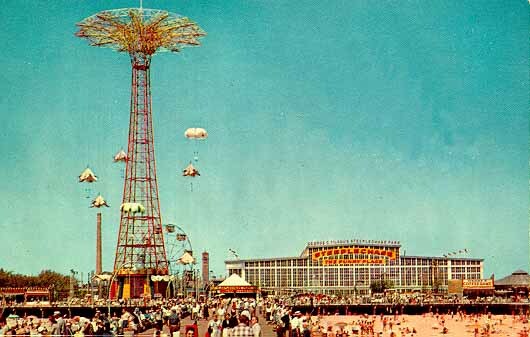 My family did not have a lot of money, and Coney Island was a good place to go to have a good time and it was affordable. Great stories, Manya. – thanks for sharing here!